Is your patient legally dead? • How and when they can be completed? • Whether you need police assistance when completing a death certificate under unclear circumstances? • Whether you can charge for the service ? 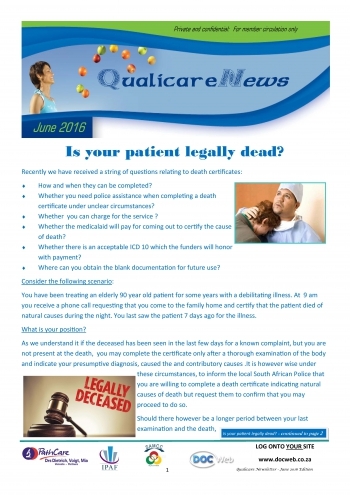 • Whether the medicalaid will pay for coming out to certify the cause of death? • Whether there is an acceptable ICD 10 which the funders will honor with payment? • Where can you obtain the blank documentation for future use? You have been treating an elderly 90 year old patient for some years with a debilitating illness. At 9 am you receive a phone call requesting that you come to the family home and certify that the patient died of natural causes during the night. You last saw the patient 7 days ago for the illness. As we understand it if the deceased has been seen in the last few days for a known complaint, but you are not present at the death, you may complete the certificate only after a thorough examination of the body and indicate your presumptive diagnosis, caused the and contributory causes .It is however wise under these circumstances, to inform the local South African Police that you are willing to complete a death certificate indicating natural causes of death but request them to confirm that you may proceed to do so. Should there however be a longer period between your last examination and the death, it is most wise to decline the issuing of a death certificate until after the South African Police have investigated and then indicated to you, in writing, that they do not expect foul play. This delay however inevitably places you in an invidious position because the family expect you to issue the death certificate with all haste so that the funeral arrangements can proceed. The undertakers however are highly experience in this matter and should guide the family accordingly. Do not be pressurised by any party to go beyond your duty. So what can you charge for the service, or indeed, can you charge at all? (Death in circumstances where the body of the deceased was found and no cause could be discovered). R99 Other ILL Defined and unspecified causes of mortality .Death NOS (not otherwise specified)Unknown cause of mortality. Most funders will accept these codes together with the 0145 for a house call. Technically the accounts should be sent to the estate of the deceased person, but this is usually only if the patient is not covered by a medical aid. Remember however, it is good practice to send the medical aid account for this particular service as soon as possible and in the above scenario, no later seven days after the date of your service. In the case of a private patient /family, it is always wise to explain your fee telephonically in advance and request that you are paid upon completion of the examination of the corpse, lest your payment becomes mired within the deceased estate. Remember once again that there is no fee for the completion of the death certificate itself. Recently it has been reported to us that clerks at the Department of Home Affairs have refused to supply the blank death certificates unless the practitioner appears per certificate, in person. It has however been taken up with the Department and the Dr now has to appear at Home Affairs once to register with them where after, it has been reported to us, that he may send a staff member with a letter written on practice station requesting a number of blank certificates. It will be important for you to report back to Qualicare should this process not the implemented at your local home affairs office so that we can take this up again. Finally, never be tempted to certify death by natural causes via a cursory look at the body at an institution or in the back of a hearse from the funeral parlour. A well known case from a retirement village is a case in point whereby a series of elderly persons were, buried after a “natural causes” death certificate was issues, exhumed many months later and found to have been strangled and raped.